If you’re looking to convince yourself, your boss, or a client to do a posting on Reddit, this is your section. If you’re already aware of Reddit’s marketing opportunity, skip to section two. With our small-niche client receiving these results, use our action-oriented post to create your own Reddit profit. The rest of the post outlines step one to ten, which can easily be applied to any niche. A Subreddit, simply a subsection of Reddit, is geared towards one specific topic or expertise. It is crucial to find your website’s specific niche subject, and post within that Subreddit. You can use advanced Google searches such as: inurl:reddit.com Broadway + NYC, or browse this list of all subreddits. For example, if you were working with the boxing company Everlast, the boxing subreddit would be an excellent category to post under. http://www.reddit.com/r/boxing. In our client’s case, Anfield Shop sells Liverpool Football Club merchandise, so we used http://www.reddit.com/r/liverpoolfc. Posting outside of that subreddit will mean an out of context conversation, and uninterested users. It could go as far as hurting your own brand. Once you have spotted the corresponding subreddit, the first step is to contact the moderators, notifying them of your interest, and asking them for general feedback/thoughts. Veteran lurker here – coming out of the shell! I work with http://www.anfieldshop.com, Liverpool FC merchandise and items, and of course our team loves the /r/liverpoolfc subreddit. We were thinking of doing a post – either a competition (tell us your favorite story) with LFC prizes, or doing an AMA about running our own shop, or some other type of post. Just so we’re clear, by no means are we looking to abuse this awesome subreddit. Our intent is to add value – so what do you think users would like to see from a small company like us? Thanks so much for your time guys! Sincerely, sincerely appreciated! 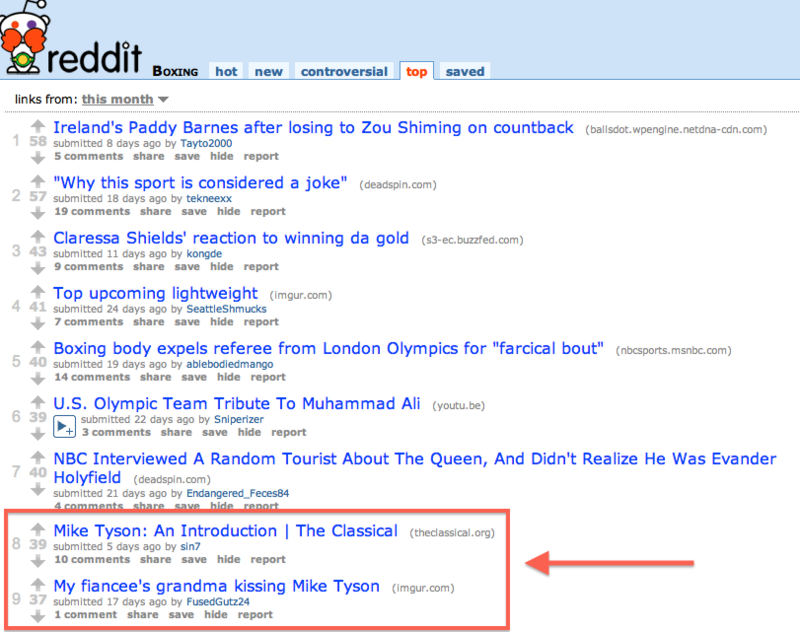 Using the “top-post method”, it is clear that the boxing subreddit has a strong interest in Mike Tyson, and anything related would do stellar in this community. Everlast sponsoring an interview between Reddit users and Mike Tyson would be recipe for viral internet marketing (although risky given his reputation). Both AMAs and Giveaway post tend to to go over very well on Reddit. It gives users an opportunity to find out more information about something or someone they are curious and passionate about. Again, getting that conversation started is the most difficult part, but these types of post are designed around igniting users to post on your thread. In addition, it can be difficult to navigate a client or person via telephone through Reddit’s registration and posting process. I have my own horror story, so on the second go-around I created this guide, which can be sent to clients to help them through the process. 1. Prior to posting on Reddit, did you have any concerns going into it? Looking back as a seasoned pro, how would you respond to an individual/company with the same concerns? I was perhaps a little apprehensive after looking a bit more into it. As a business there are always sometimes questions you can’t answer to the general public and I didn’t want to get stuck in an uncomfortable position. 2. 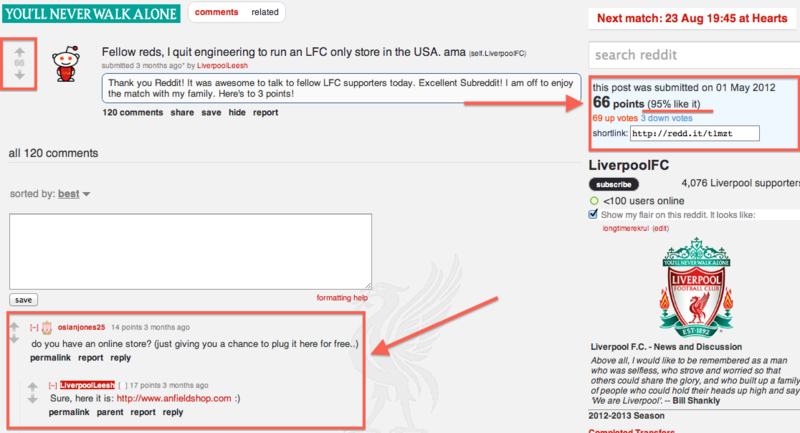 Besides bottom line or website visitors, what was the biggest impact or impression Reddit made on Anfield Shop? Being able to talk to our customers. We enjoy the banter that comes with the team, the products, etc. It also gave us a good idea on what products to look for in the future as customers told us they were looking for things or mentioned products they wish existed. 3. Lastly, if you could give a single tip to a new user posting about their business, what would it be? Be as open and honest as possible. Sometimes the tone of reddit might come out a little aggressive but chances are your customers are just passionate. The more they get to know you and what your shop is about, the more they’ll come back and be longtime customers. Take any sort of criticism to heart and see if there are ways you can improve. Thanks, this is solid advice. Heading over to Reddit to soak up the ambience and suss out the lay of the land. I think it is surely a group of strong communities and big opportunities. Great post, I love seeing how people leverage Reddit. It is a great community. http://metareddit.com/ . This shows you several sub reddits around a specific keyword. Hope this helps others out. This is awesome James. I’ve had similar experiences with Hacker News as well. I think the principals are quite similar. I love the community over at Hacker News! Incredible quality of information and contributing users. One thing I would add is that they can usually smell marketers a mile away, so it’s usually best to be completely honest about who you are. If you go in trying to be sneaky, there is a good chance you will end up in a bad spot. 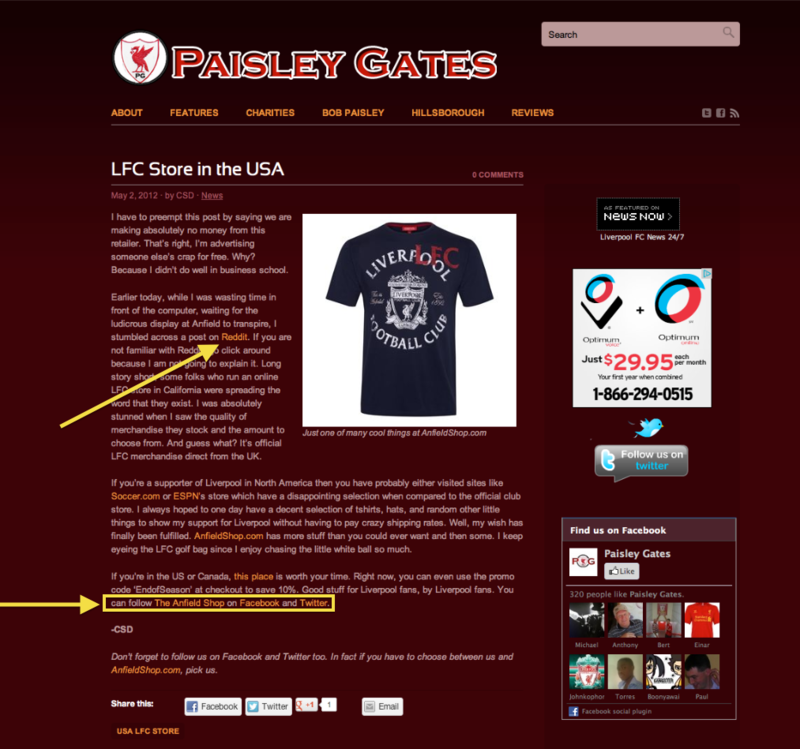 Hence your example “Hey guys here is my LFC store” instead of “Hey look at this cool site I found”. I’ve never really spent the time getting into Reddit but I’ve been thinking about it. I always liked forums so I don’t know why this hasn’t caught on with me yet. 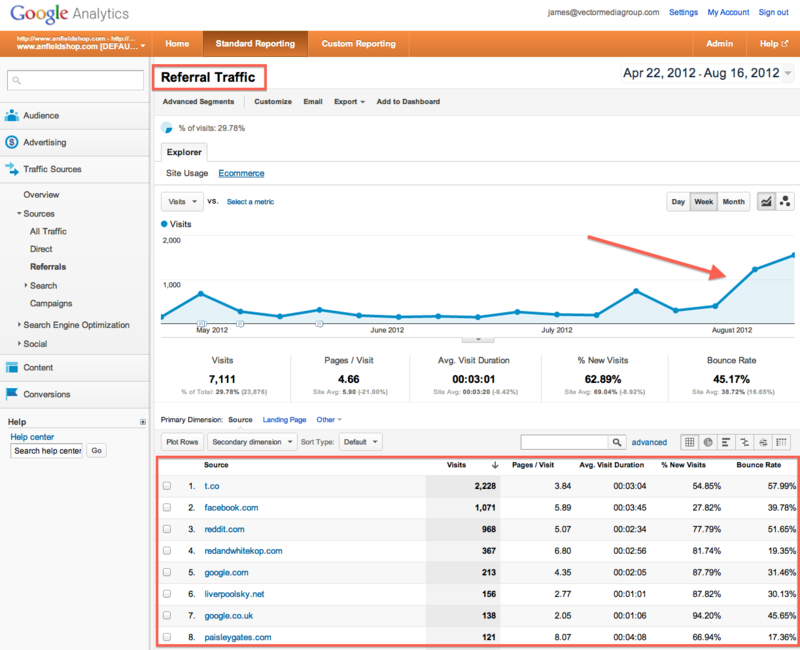 Just like any community website, there is a little bit of a learning curve. In general, the more time spent over there, the better your marketing campaigns will go. But given the success our clients have had via Reddit, it has been time well spent! Great post, James. As others have said before me, I haven’t yet spent the time to get into Reddit. However, this is a great kick-start guide and it’s certainly something I’ll take into more serious consideration for the right client. Clearly a LFC website gives you some fantastic opportunities to encourage conversation and get links – but the most valuable advice you gave was ‘how’ to talk to people, without coming across as a hit and run marketer. Thanks for the guide, and nice work once again! As a Redditor – this post makes me really squirm a bit. I really, really don’t want to be a cynic – but marketers have a serious tendency to ruin great communities by introducing monetary value into a setting dominated by social value. The thing about Reddit is that you will quickly get called out if you are trying to do marketing – and have your brand seriously ruined. Reddit does offer advertising opportunities http://www.reddit.com/ad_inq/ that are good, transparent ways to get introduced to the community. But if you are interested in doing Reddit for the sake of Reddit – by all means, come and join in! Glad to see a fellow Redditor! As you mentioned, bringing social value as the primary intent adds to a great community. Similar to the article’s example, with the intent on sparking conversation and engaging users, The Oatmeal itself uses this very same playbook and it has worked phenomenally. Become a leading contributor and subreddit expert, and the product sells itself. Of course you want to take a look at the top posts in a sub-reddit without removing self posts and imgur links, because those can certainly contain inspiration, but the above search syntax provides you with a bit of a different view without having to go through dozens of pages to find examples of linkbait ideas that did well on reddit.